Unique football fiction that hammers the ball into your deepest heart. Football: it’s the beautiful game. But it’s more than a game. It’s triumph and heartbreak and passion and glory. It’s the essence of life. Tough-talking sports journalist Paul Faustino is a lifelong fan. Now he’s reporting on three mysteries involving the world’s greatest players. A legendary goalie’s eerie secret. A vanished teenage football prodigy. A star player brought down by a rival. Football stories like you’ve NEVER read before. Love, death, magic, murder and the media. 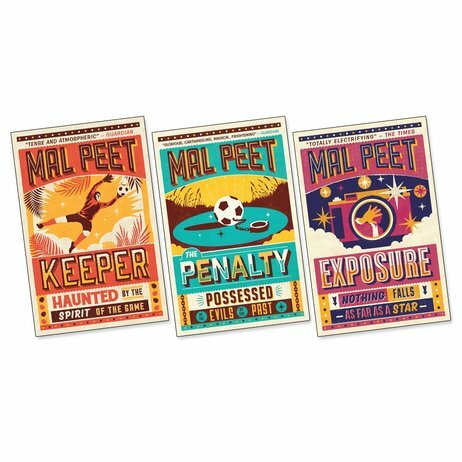 Carnegie winner Mal Peet was a writer who knew the score. This series contains mature content.